This Affiliate Terms and Conditions Agreement is entered into by and between you (the Affiliate)and Hybrid Media on acceptance of this agreement evidenced by clicking on the "Sign Up" button on the Hybrid Cash or The Miss Hybrid Site. 1. BASIC AGREEMENT: Upon acceptance by the Affiliate of the terms and conditions contained herein and continued compliance herewith, Affiliate shall be allowed to participate in the Hybrid Media Affiliate Program wherein Hybrid Media shall enable Affiliate to use certain intellectual property of Hybrid Media on Affiliate's Web sites for marketing and promotional purposes only. As consideration for any traffic directed by Affiliate to Hybrid Media through Affiliate's marketing and promotional efforts and that converts into revenue to Hybrid Media, Hybrid Media shall pay Affiliate compensation, as set forth in section 3 below. The intention of the scheme is that the affiliate brings the traffic and does not simply try to step in between already established traffic. I consider this behaviour to be contrary to the purpose and the spirit of the scheme. 2.2 A limited non-exclusive, non-transferable and revocable license to access and download promotional banners, and other promotional materials created and owned by Hybrid Media for use on Affiliate Web sites for the exclusive purpose of advertising, marketing or promoting Hybrid Media Web sites. Affiliate may post as many of these banners and other materials on its site(s) as desired. 2.3 Hybrid Media owns and retains all right, title and interest in and to its intellectual property, copyright, trademarks, patents, and in the files, promotional banners and other material provided by Hybrid Media, including all images therein. Upon termination of Affiliate's participation in the Program and/or termination of this Agreement, the grant of right and license set forth in subsection 2.2 above, shall cease and terminate, and Affiliate shall immediately remove all Hybrid Media files, banners, ads, and any and all other Hybrid Media intellectual property, copyrighted material, and trademarks, if any, from Affiliate's Web sites. 2.4 Affiliate is not authorized and shall not change Hybrid Media's names, file names, trademarks, design logos, banners, ads or other material for any purpose other than as expressly set forth herein or in any modification to this Agreement by Hybrid Media. 2.5 Affiliate specifically acknowledges and agrees that it shall not modify, edit, resize or otherwise change any of Hybrid Media's names, file names, trademarks, design logos, banners, ads or other material for any purpose whatsoever. Affiliate further acknowledges and agrees that any such change or changes will be a material breach of this Agreement and shall constitute an infringement of Hybrid Media's copyrighted and/or trademarked intellectual property. 2.6 Affiliate agrees and covenants to notify Hybrid Media of all Uniform Resource Locator (URL) a.k.a. "Web site" locations where it has published Hybrid Media's names, file names, trademarks, design logos, banners, ads or other material pursuant to this Agreement, specifically identifying the names, file names, trademarks, design logos, banners, ads or other material posted at each URL. Affiliate further acknowledges and agrees that failure to notify Hybrid Media of these locations constitutes a material breach of this Agreement and each such posting of which Affiliate fails to notify Hybrid Media shall constitute an infringement of Hybrid Media's copyrighted and/or trademarked intellectual property. Affiliate will not use trickery of false terminology, for example, offer free passwords to members areas, non existent discounts etc. I run an honest, quality site and do not want my hard work soiling with these underhand tactics. Anyone doing so will be removed. Any attempt by Affiliate to masquerade as a Miss Hybrid site will result in immediate termination of affiliate account, with any sales derived being forfeit. This includes registering Domain names, creating blogs and social media accounts which could confuse viewers that they were visiting an official Hybrid Media website. Please do not post links to your affiliate coded galleries of mine, on any of the freeones sites. I spend a huge amount of time on freeones and do not welcome a gasket appearing between my efforts and my galleries. I consider this behaviour to be contrary to the purpose and the spirit of the scheme. 3.1 Affiliate shall only use and promote on Affiliate Web sites Hybrid Media approved advertising banners, links, and other promotional materials. 3.2 Affiliate shall not use or employ any form of mass unsolicited electronic mailings, newsgroup postings, IRC postings, adware, spyware, malware marketing or any other form of "spamming" as a means of promoting Affiliate Web sites or for the purpose of directing or referring users to any web sites owned, operated or controlled by Hybrid Media. Affiliate further acknowledges and agrees that Hybrid Media has the right to immediately, and without notice, terminate your participation in the Program, in its sole and absolute discretion. 3.3 Compensation and method of payment. Pay periods are monthly and payouts are held for an additional pay period. The minimum payouts are $100 for all payout methods. All payment forms incur a $2 charge (except for wire which costs $25). Webmasters will be paid by cheque by default and this sent in the mail to the address you have indicated in your application. Affiliates can choose to be paid via Paxum or payments can be requested by bank wire at the Affiliate’s expense of $25. Unpaid earnings are carried to the following pay period(s). If an affiliate choses to leave the scheme of ceases to promote our sites, we reserve the right to withold any outstanding compensation due, for an additional time, untill all chance of chargebacks of the sales which generated that compensation has expired. NOTE: Hybrid Media will not tolerate spamming. Mail promotions must be done so as to comply with the can-spam act. We review Affiliate performance regularly. If you do not send traffic, your account will be removed without notice. I expect to work closely with my affiliates and deal with any issues, in private with them. To this end If an affiliate choses to post any defamatory comment on any public board or forum, the affiliate will immediately removed from the scheme and loose all rights to any unpaid compensation. Hybrid Media reserves the right to change these terms and conditions at any time, without notice. The terms will deemed to be changed once published here. 4. 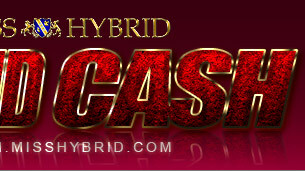 ACCEPTANCE AND EXECUTION: By CLICKING ON THE "SIGN UP" BUTTON on the Hybrid Cash or the Miss Hybrid site, and by supplying Hybrid Media with all the information required to create an account on the Program, Affiliate has accepted all of the terms and conditions set forth herein above.